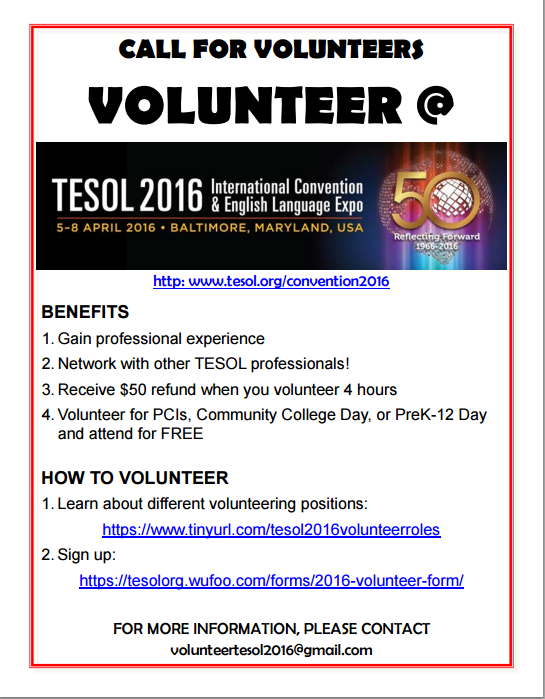 The TESOL Convention is coming to Charm City and the organizers are looking for a few good volunteers. If you are already planning to attend the convention, this is a great way to expand your professional network. If you are on the fence about coming, keep in mind that volunteers receive a $50 registration refund. There are a variety of ways to volunteer. Interested individuals are encouraged to sign up via the Google form. For more information, please contact volunteertesol2016@gmail.com.